Soon you might see your food delivery by a Drone rather than the army of boys zipping on bikes, weaving through the traffic. You could order a drone cab and travel to the destination straight as the crow flies and control your personal drone with the touch on the screen of your personal device. This is the level of freedom and facility that is being planned to be rolled out for the Indian public use. There is a need to keep it Whippy, Flippy and Quiet. Are you concerned or relieved, is a debate, which hasn’t yet taken place. The days when bullock carts used to transport passengers and goods were slowly replaced by cars, trucks, and buses doing the same. Now the same is poised to be replaced by traffic in the air. The change is inevitable; therefore it is the time for debates and discussions to form regulations, which facilitates the growth responsibly. We have to inculcate good habits at the onset before its too late. The traffic on the roads is an example of the situation, which is out of control. If the public is given access to flying drones at their will then there is a need to educate and control them to form good habits. Aviation in India needs to be institutionalized for this purpose. We need high-class regulations, training facilities, research & development, and manufacturing. The public has to act responsibly to prevent clamping down of their freedom. India is at the threshold of becoming the world leader in Remotely Piloted Aircraft System (RPAS), also called “Drone”. After the launch of the DigitalSky Platform under Civil Aviation Regulations (“CAR”) 1.0 with effect from December 1, 2018, a basic framework for regulations have been established. The focus now has been on addressing challenging frontier issues such as Beyond Visual Line of Sight (“BVLOS”) & Autonomous Operations. 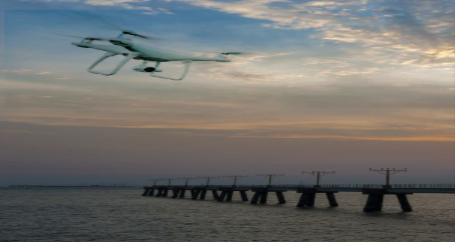 Drones could be used for surveys, disaster management, transporting medical supplies or other commercial goods, surveillance and last but not the least, transporting passengers like taxis in the skies. Drones capable of transporting passengers and cargo could be launched without any red tape or permissions required if they meet the regulatory requirements and are flying in the green corridor. This is a marked shift from the current regulations for general aviation aircrafts, which have to seek permissions from multiple authorities before taking off in a controlled zone where other commercial aircrafts are flying. Public opinion needs to be sought since there will be issues like privacy and noise if drones are flying over and in close proximity to their living spaces. The multi-modal concept proposed needs to be tri-modal, wherein the authorities also have control of the drone in the eventuality the drone stray’s from the designated path and is a threat to others. In the drone ecosystem roadmap, the basic tenet is that no operation would be allowed over civilian airspace unless manufacturers meet certain standards, and operators prove the safety of all stakeholders in designated test zones. Further, even after such demonstrations, operations are only allowed in well-defined Drone Corridors. The regime of No Permission, No Take-off (“NPNT”) will continue in this CAR 2.0, to provide security from unauthorized fights. For privacy, manufacturers will be required to adhere to privacy by design standard, eliminating risks of future privacy harms by operators. Overall, the CAR 2.0 enables innovation without significantly compromising safety, security or privacy. (a) BVLOS Operations: Expansion of operational airspace for UAS operating beyond the visual line of sight and above the current limit of 400 ft.
(b) Drone Corridor: A segregated airspace defined by the appropriate authorities in consultation with the airspace designers to keep commercial UAS operations out of the non-segregated airspace in which manned aircrafts operate. (c) Autonomous Operations: Use of algorithms for piloting may be permitted, but only if adequate safety, security and privacy principles are demonstrated in the design of operations. In order to adhere to safety standards, there would be comprehensive training of the pilots flying drones heavier than 250 gms. These drones would be registered and the pilots will be imparted drone license. The airworthiness aspects have also be laid down in the CAR. As we step into the new era, all drone users with drones in the Nano category weighing 250gms or less are welcome to fly them without any license but with a restriction of 400 feet and away from restricted airspace. For ones who plan to fly heavier or bigger drones, for private or commercial use, they need to register on the digital India website, https://digitalsky.dgca.gov.in/ and follow the procedure for acquisition and operation of drones. There are designated areas which have been designated as test spaces where the concept models can be tried out in real time before approval and implementation in public space. There is a Buzz in the air that now Everything can Simply Fly.